Next week brings not just a new year but also a new United States Congress. Each new Congress has the right to establish its own rules. And that’s why next week is the best opportunity finally to end the massive Republican obstruction of the work of the United States Senate. In the historic 111th Congress, Sen. Mitch McConnell and the Republicans decided to create a 60-vote Senate, which meant that 60 votes were needed on absolutely everything. Which means that they filibustered every single bill, every single nomination, every single amendment, even every single motion, or at least all those for which the Senate rules allowed them to force a 60-vote supermajority. 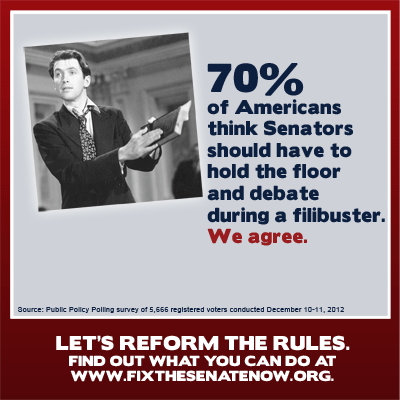 It wasn’t 137 filibusters; it was far, far more. Bernstein offers a more detailed primer about how Republicans turned rarely used delaying tactics into weapons of mass obstruction on his own blog. But we can change all this next week. Make a New Year’s resolution to ring out the old year and ring in the new by calling your Senators and telling them you want real Senate rules reform. ● Hear the media briefing from AFJ President Nan Aron, Larry Cohen of the Communications Workers of America and Michael Brune of the Sierra Club on our YouTube channel. We wish you, and the new United State Senate, a happy and productive New Year.